Demand is back on track for motorcycles. The segment, which accounts for about 62-63 percent of the overall domestic two-wheeler market annually (FY2018), has registered a 19.47 percent jump YoY in Q1 FY2019. Due to the early arrival of the monsoon season, OEMs have begun stuffing their dealerships with adequate stock to minimise the waiting period across popular models, particularly those that are regulars in the Top 10 lists every month. 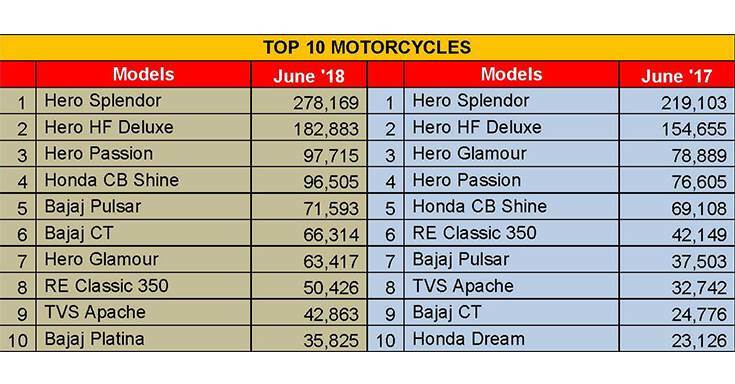 The highlight of the Top 10 motorcycles despatched to dealerships in June 2018 is Bajaj Auto, which holds the position of being India’s fourth largest two-wheeler company and the second largest in the motorcycle segment, behind only Hero MotoCorp. In June, Bajaj Auto reported total domestic sales of 200,949 units, which marked an unusual surge of about 86 percent YoY (June 2017: 108,109 units). In its early report, Autocar Professional had pointed out that the sharp growth in Bajaj Auto’s monthly volumes can be attributed to the anticipated demand for products from the Pulsar, CT100, Platina and Discover brands. In June 2018, the company holds three positions in the elite list of the Top 10 bestselling motorcycles unlike two in June 2017. While the Pulsar brand stood at the fifth rank with sales of 71,593 units (up an impressive 91 percent YoY), the CT100 (66,314 units, up a sharp 168 percent YoY) and the Platina (35,825 units) took to the sixth and the tenth positions respectively. The newly rolled out Pulsar Classic and the Twin Disc variants are understood to be contributing well to the growing sales of Bajaj Auto. Meanwhile, the CT100, being the most affordable motorcycle from the stable of Bajaj Auto, contributes critical volumes to the company’s monthly performance. For the other top selling models, the story remains the regular one. The Hero Splendor continues to be the most popular motorcycle with sales of 278,169 units in June, up 27 percent YoY. Hero’s HF Deluxe and Passion brands take second and third positions with sales of 182,883 units (up 18.25 percent YoY) and 97,715 units (up 27.56 percent YoY) respectively. Honda’s top selling motorcycle, the CB Shine, bags the fourth spot with sales of 96,505 units, up 39.64 percent YoY. The model continues to retain its leadership in the 125cc executive commuter motorcycle segment. Its archrival, the 125cc Hero Glamour, stands seventh with sales of 63,417 units (down 19.61 percent YoY) during the last month. Royal Enfield’s top selling motorcycle is the Classic 350, which has garnered sales of 50,426 units in June thus marking a YoY growth of 19.63 percent. TVS Motor’s premium motorcycle brand, Apache ranks ninth in the list with sales of 42,863 units in June. The Apache umbrella, which has seen a slew of new and updated models in recent months, has recorded a good 31 percent jump YoY. It would be interesting to watch out how these and the other popular motorcycle models perform as the industry is bracing up for a good market demand in the coming months.